Screening of "The Many Storeys and Last Days of Thomas Merton" with Morgan Atkinson presenting new segments and interacting with the audience afterwards in a Q & A session. Morgan Atkinson is a documentary producer based in Louisville, KY. In a career spanning 30 + years he has focused on people or groups seeking meaning through a spiritual search. His earlier work on Thomas Merton entitled “Soul Searching: The Journey of Thomas Merton” was aired nationally on PBS. Over his career he has written and produced more than 15 long-form documentaries that have been broadcast on PBS stations across the country. "Thomas Merton, Henri Nouwen and Dorothy Day"
Robert Ellsberg was managing editor of The Catholic Worker for two years (1976–78), a job that would introduce him to Dorothy Day and consequently would allow him to work with Day for the last five years of her life. This life-changing experience prompted him to convert to Catholicism. Robert returned to Harvard, and earned a degree in religion and literature, and later a Master's in Theology from Harvard Divinity School. In 1987 he began work as editor-in-chief of Orbis Books. He is the author of several books, many of which have received awards; his Blessed Among All Women tied a Catholic Press Association record by winning awards for Gender, Spirituality, and Popular Presentation of the Catholic Faith. He is the editor of the published diaries and letters of Dorothy Day. All places for the workshop have been filled and there is a waiting list in case any become free. Full refund (less $25 non-refundable deposit) for cancellations before July 1st. No refunds after October 1st. As you make plans to attend the conference, allow time to enjoy…. KyCAD exhibition "Merton Among Us"
The exhibit will feature interpretations of Merton by seven visual artists and seven guest writers. A 40-page catalog about the exhibitions is being produced. 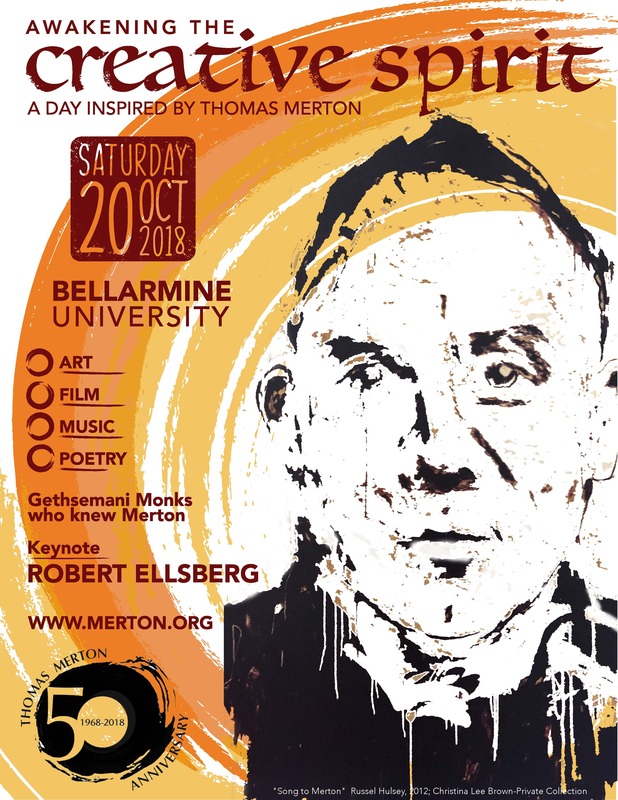 Special exhibit related to Merton's death will be on exhibit. Merton Square, 4th Street and Muhammad Ali Blvd. Site of Merton's Epiphany on March 18, 1958 in downtown Louisville. Merton's mystical experience led him to become more involved in social justice issues like war, nuclear escalation and racism. In Louisville, at the corner of Fourth and Walnut, in the center of the shopping district, I was suddenly overwhelmed with the realization that I loved all those people, that they were mine and I theirs, that we could not be alien to one another even though we were total strangers … There is no way of telling people that they are all walking around shining like the sun.